Robert Steinem's artwork has been a process of discovery. Drawing since early childhood, he began painting as a teenager. His work then was influenced by the surrealists, particularly de Chirico and Magritte. However, after a service connected injury in the Marines, Steinem quit painting for twenty years... yet the thought of painting kept nagging at him. Finally, instead of being limited by his legal blindness, he found a way to work through those limitations. An ophthalmologist friend designed special glasses, and Steinem reconstructed his easel so it was strong enough to stand on. His detail work requires an almost "nose to canvas" approach. Although his academic resume reflects an early interest in the written word, and in 1980 he qualified as a poet to be listed in the Directory of American Fiction Writers and Poets, since the mid-1990's Steinem has concentrated entirely on his painting career. Since he's completely self-taught, and approached painting with a poet's sensibilities, he knew he could find the surreal and abstract subjects he sought in water and glass with their slightly warped visions of our world. His own philosophical statement about his art is as simple as Paul Klee's. When asked about what he does, Klee said he just likes to take a line for a walk. When asked the same question, Steinem responds that he just likes to take the eye for a ride. This is a ride that tends to transport the viewer above and below the surface of the canvas, most notably in his reflection paintings. As Steinem says, "Everything we see is reflection, so rendering the reflection of reflected light is like painting an echo." 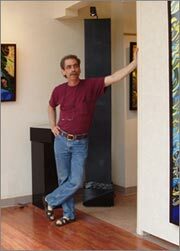 His architectural paintings begin with excursions to take reference photos with his self-focusing Nikon (he composes, the camera captures the details), and unlike many other artists working in this genre, he does not project these images onto the canvas, preferring an organic process of creation that results in his compelling style of "relaxed realism". 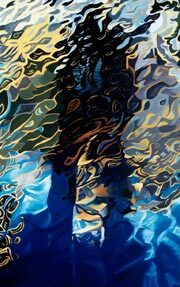 Steinem's paintings tend to be eclectic, yet he paints mainly in three distinct subject styles- Architectural, Snow Scenes, and a collection of nature and water images called Reflected Light. After a successful show several years ago in Washington, D.C., his work has entered many private and public collections. Three of Steinem's National Cathedral paintings were selected by the Cathedral's Museum Store to be sold as limited edition prints. One of his snow paintings was selected by the Christopher Reeve Foundation for their 2005 calendar, with a print run of 3 million. Steinem has had a number of solo and group shows. Recently one of his canal reflection paintings was juried into a group show at the Philadelphia Museum of Art. He continues to produce work that is refreshingly new and captivating, with the unerring ability to evoke the mood of a scene, whether the subject is an urban landscape, or the vibrant transparency of an isolated country pond. His home and studio are in rural Massachusetts at the foothills of the Green Mountains, where he lives with his wife Kathy, a college dance instructor who was a principal dancer with the Rhode Island Ballet. He also spends part of each year in Washington, D.C., and in coastal South Carolina.